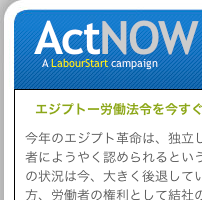 Thanks to the help of Mac Urata at the ITF, we finally have campaigns – and a 122-strong mailing list – in Japanese. We will begin outreach this week to Japanese trade unionists. I don’t have to tell you all how important this is and how much we appreciate Mac’s help.